Have a delicious, nutritious dinner on the table in 25 minutes! 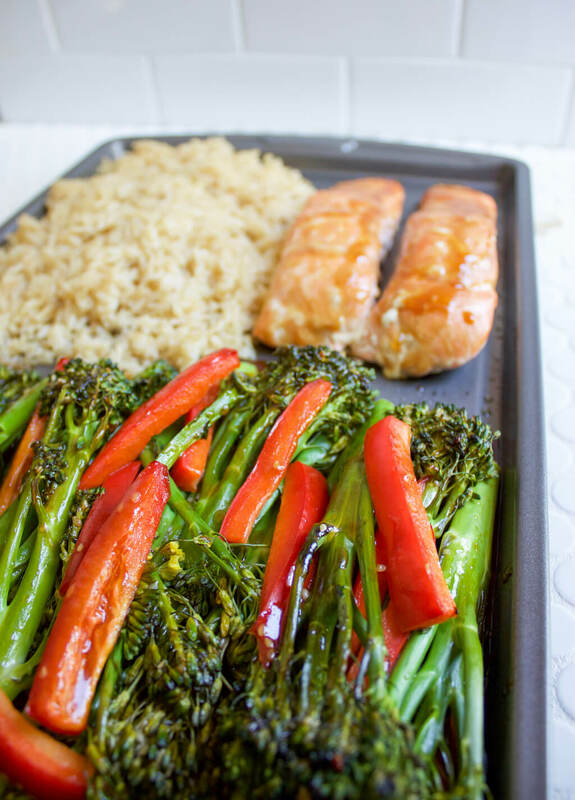 We worked with our brand partner Mann’s Fresh Vegetables to develop this recipe for Baked Salmon and Sesame Glazed Broccolini® Sheet Pan. Sometimes, the worst part of making a meal is knowing all the dirty dishes that will be around after it’s over. That’s why sheet pan recipes are so wonderful. Clean-up is a breeze. Today we’re sharing an easy and delicious sheet pan recipe featuring Mann’s Broccolini®. 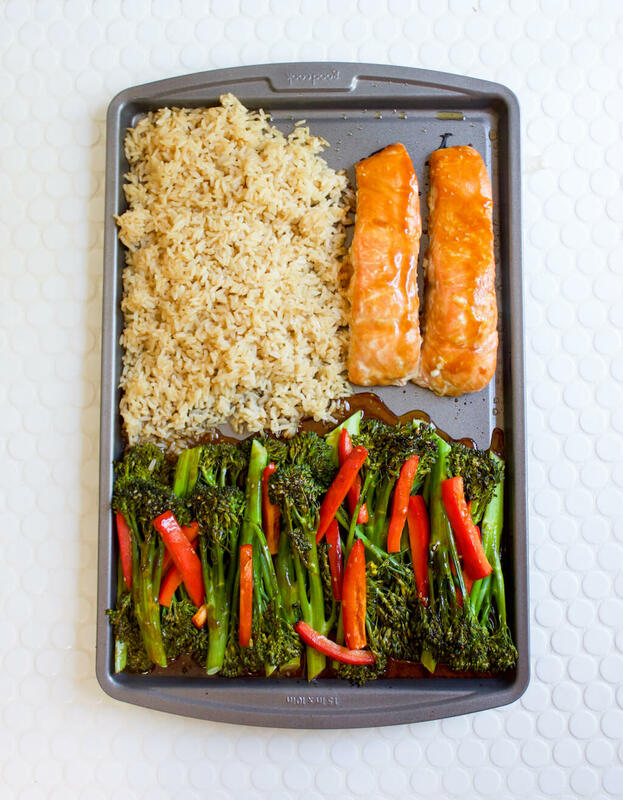 Baked Salmon and Sesame Glazed Broccolini® Sheet Pan takes just minutes to prep and 20 minutes to bake. Most of the prep time, making the sesame glaze, is done while the sheet pan is in the oven. You can have this meal on the table in 25 minutes! With many quick and easy recipes, you sacrifice taste for efficiency and ease. Not so with this one! 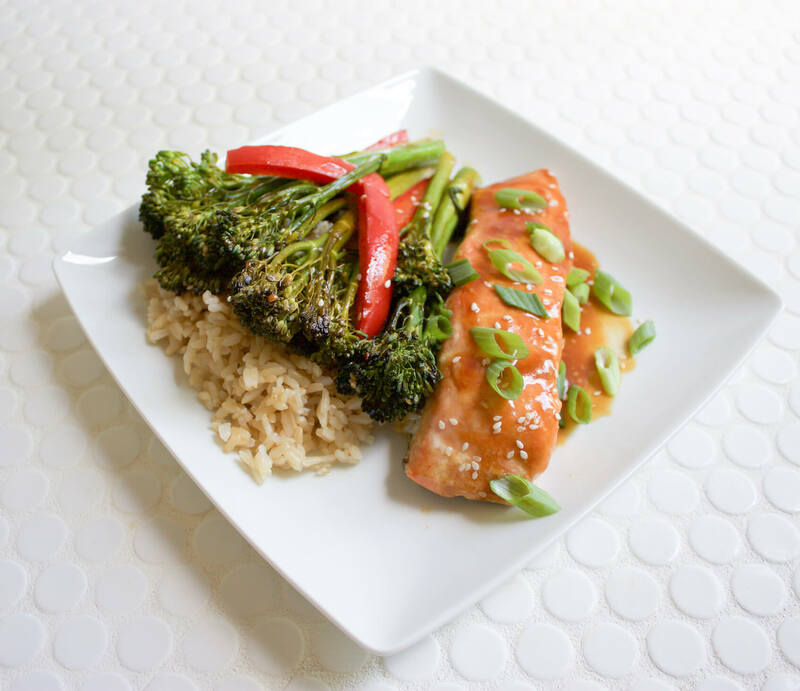 The salmon and Broccolini® is brushed with a soy sesame glaze that is bright and tangy. It gives the dish an Asian flair. The sticky rice gets just a little bit crunchy when baking, which brings a great texture to the dish. What’s the Difference Between Broccoli and Broccolini®? Broccolini® is a hybrid of broccoli and Chinese kale. Broccolini® stalks are slender and tender, considerably more so than broccoli. On top of the stalks sits a small, tender floret. Broccolini® is sweeter than broccoli. If you have a child or family member who does not like broccoli, encourage him or her to try Broccolini®. Sometimes the florets on Broccolini® will include small yellow flowers. If the weather was particularly hot when the Broccolini® was grown, you may see these flowers open up a little more. These flowers are completely safe to eat — there’s absolutely no need to remove them! Broccolini® is edible from flower to stem. Mann’s Broccolini® requires zero prep work before using. It comes washed and ready to eat. For this recipe, you will toss the Broccolini® with sliced red peppers and toasted sesame oil. You’ll bake it with the salmon and rice — all on the same sheet pan. Halfway through baking, you’ll brush your homemade soy sesame glaze on both the salmon and Broccolini®. After 10 more minutes of baking, your meal is ready. Plate and garnish with thinly sliced green onions. Now, all that’s left to do is enjoy your dinner and relish in the fact there are very few dishes to wash.
Lightly oil a sheet pan. On one section of the pan, place the salmon. On another, place the pre-cooked rice. Toss Broccolini® with red bell pepper and 1 tbsp of toasted sesame oil. Place on sheet pan. Put sheet pan in the oven for 10 minutes. While the sheet pan is in the oven, prepare glaze by combining all ingredients and simmering over medium-low heat until it begins to thicken. Stir frequently. 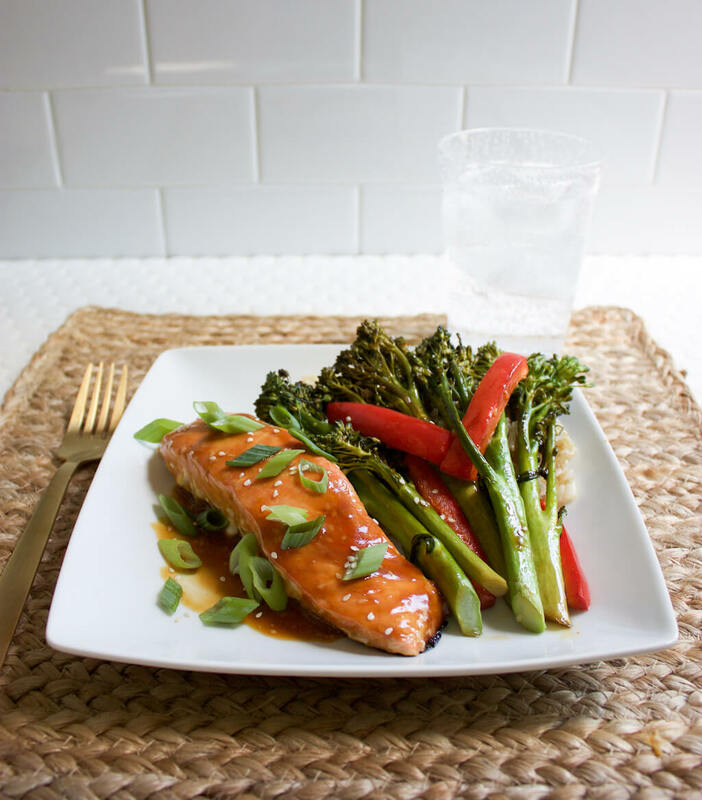 Remove sheet pan from oven after 10 minutes and brush Soy Sesame Glaze over salmon and Broccolini®. Stir rice. Return to oven for another 10 minutes. Plate each dish and garnish with green onion. Mann’s was responsible for introducing Broccolini® to the United States twenty years ago. It’s now one of the fastest-growing vegetables on restaurant menus! Mann’s are true experts at growing and harvesting Broccolini®. 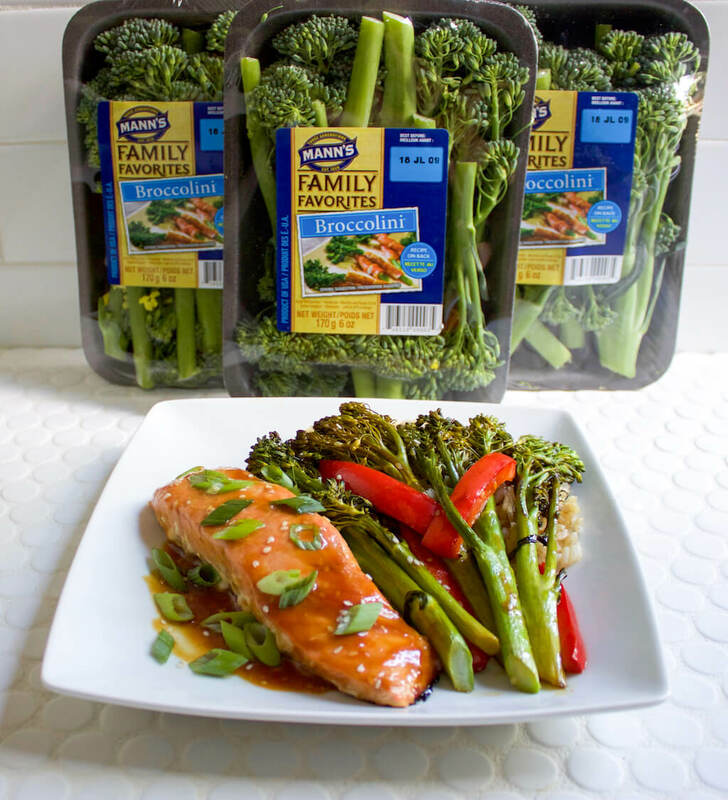 Look for Mann’s Broccolini® at your grocery store and try this recipe for Baked Salmon and Sesame Glazed Broccolini® Sheet Pan. Be sure to let us know what you think! What’s your favorite way to prepare and serve Broccolini®? Share in the comments below.